If I’ve never taken a spin class before, will I be able to keep up? 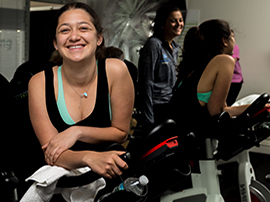 Many first-timers can be intimidated, and yes, indoor cycling is an intense cardio workout, but the beauty of it is that you can ride at your own pace. Although classes are in a group setting, you can ride to your own comfort level so you can quickly acclimate to the routine and build resistance as you ride more often. We recommend that you try it a couple of times and you will quickly see increased resistance, speed and endurance. The more you ride, the more efficient you will become and the more calories you will burn. Do I need to wear bike shoes? Bike shoes give you a better and more powerful pedal stroke so you can fully engage your legs in the movement. It allows for push/pull action and it also ensures that you are securely fitted on the bike. 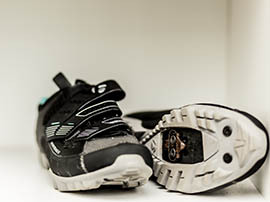 We recommend cycling shoes with SPD clips. Our bikes also accomodate the LOOK pedal clips. For those cyclists who prefer to wear sneakers, you still can get a good workout, but it is best to wear fully supported sneakers. It is best to dress in either cycle shorts or comfortable exercise clothes to avoid chaffing. Lightweight and moisture absorbent clothing will allow you to move easily on the bike. You can wear either sneakers or bike shoes as all of our bikes can accommodate either. It is a good idea to bring a bottle of water to class as well. We have spring water for refills and sell bottled water if you forget. We also provide towels. Other than that, just bring your great energy. 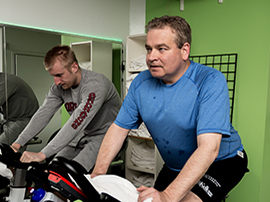 It is best to arrive 15 minutes early to your first class so that we can help make sure you are well-fitted on the bike and that you understand how to use the power monitors. What is the best way to sign up for a class? Sign up online ahead of time. It guarantees you a bike and makes it easier for you to keep track of your account. 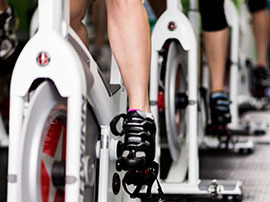 What makes indoor cycling classes different from other cardio exercise classes? How many calories can you burn in an indoor cycling class? It depends on a couple of influences, such as your weight and the intensity at which you ride. On average, cyclists can burn between 400 – 600 calories in a 50-minute cycling class. The more you challenge yourself, the more calories you will burn. What is the equivalent of taking a spin class versus riding outdoors? It primarily depends on your cadence (how fast you pedal measured in rpms). On average, a 50- minute class at a cadence of 80 – 110 rpm is equivalent to approximately 15 to 20 miles on the road. Keep in mind that the routine of the class will also determine the amount of calories burned and the mileage covered. Can indoor cycling improve how I cycle outdoors? Although indoor and outdoor cycling utilize very different techniques, learning how to increase your cadence while increasing the resistance in class, and doing various drills and rides, will help you ride faster, more efficiently and be able to power up the hills when you ride outdoors, making a significant difference in your ride. It is also a great way to train for racing. Reservations must be canceled by 6pm the night before your scheduled class, otherwise you will be charged for the class. For clients who are on the unlimited packages, if you miss more than 2 classes without canceling, you will be charged for the class and for the classes each time you miss thereafter. Are cell phones allowed in the studio? We want all of our riders to use their time to switch off and focus on achieving their personal best. We realize that sometimes there are circumstances that cause you to have to answer your phone, so please jump off your bike and step outside the studio, before answering so as not to distract the other riders.